Just think of the traffic. For most American cities, the difference in the number of people who live there and the people who only work there is small. 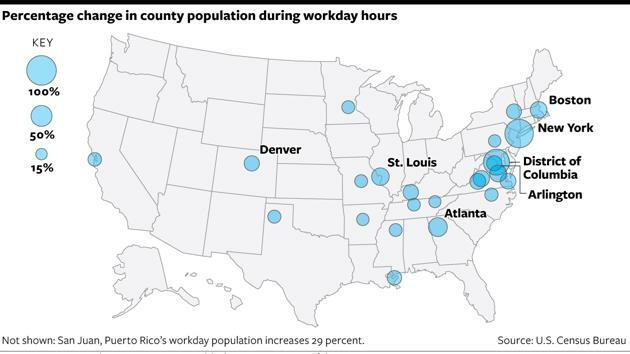 People tend to work where they live. But that's not the case for some of the leading economic hubs in the country, where employment and commerce are high. For places like Manhattan and Washington, commuters can nearly double the population during the daytime. A 2013 study from the U.S. Census Bureau outlines which major counties in the U.S. have the biggest gap between the residence population and the commuter-adjusted population, which is calculated by adding the total area population with the total workers in the area, and then subtracting the total workers living in the area. The study uses census data from 2006 to 2010. The population difference is largest in New York County, which comprises Manhattan. There, the commuter-adjusted population is 94.7 percent larger than the residence population, jumping from 1,600,00 to 3,100,00. Most of these people come from other boroughs in New York City. Commuters traveling from Kings County (Brooklyn), Queens County (Queens), and Bronx County (the Bronx) to Manhattan account for three of the largest county-by-county population flows. Researchers have extensively documented the travel habits of New Yorkers, and illustrated their movements in interactive graphics, as seen here on City Lab. Though it has a third of the population of Manhattan, the District of Columbia, too, experiences a large jump in its commuter-adjusted population, shifting 79 percent during the day. Most of the commuters come from neighboring Northern Virginia and Maryland, and they increase the population from 600,000 residents to more than 1 million people during the day. Fulton County, Ga., the home of Atlanta, St. Louis, Mo., and Richmond, Va., round out the top five counties in the U.S. with the biggest population increase from commuting. The commuter-adjusted population does not include children in day care or school, nor does it cover university students or tourists, which would encompass the complete daytime population. The residence population, too, does not include people staying in hotels, which would provide a broader picture of an area's nighttime population. If those numbers were included, the figures would be substantially larger for places like Manhattan and Washington. So would the traffic. Most of the top counties that see the largest population increases due to commuting are on the Eastern Seaboard, where there are closer pockets of largely populated areas. Cities in the Midwest and West Coast are less likely to see big shifts because of larger distances between metropolitan areas. These data are key for emergency responders, including the Federal Emergency Management Administration, which use daytime population estimates for directing resources during natural disasters. It's also important to understand the needs of a city's transportation system. And with the population increasing and the economy getting better for many of these places, the gaps might get even bigger.